Fans have been anxiously waiting to see which Bachelor in Paradise season 4 couple would leave Mexico in love and engaged. And they had to wait for the reunion special to find out! Fans were happy to see Derek and Taylor, one of the strongest couples from the start, come out of Paradise together. The adorable Derek Peth and Taylor Nolan will now plan to spend the rest of their lives together! Peth got down on one knee in front of Nolan, who gladly said yes to his proposal. People, including the other contestants, are beyond excited for Peth and Nolan and we cannot imagine any other couple tying the knot this season! It finally happened! Derek Peth got down on one knee and proposed to Taylor Nolan —and she said “yes!” Peth finally popped the question during the reunion special, and now they are the only couple on Bachelor in Paradise season 4 to get engaged. While everybody was rooting for these two on Bachelor in Paradise 2017, nobody expected Peth to ask the million dollar question. But he did, and there wasn’t a dry eye in the house! So, are Taylor Nolan and Derek Peth engaged? Yes, they are! Peth proposed during the reunion special, which was taped on August 30, 2017, with a shining Neil Lane engagement ring and Nolan agreed to spend the rest of her life with him. We will tell you more about what happened on the Bachelor in Paradise season 4 finale, right here. 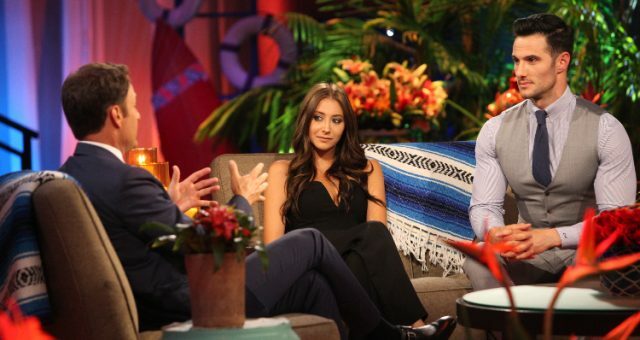 So, if you haven’t seen it yet, watch out for some Bachelor in Paradise finale spoilers! Although rumors were circulating that Peth and Nolan would get engaged after the finale, people had to see it to believe it. So when it happened, everybody wanted to congratulate the couple who have been together since the show first started filming. It was a sweet moment on an otherwise stressful show that had its share of controversies and unhappy endings. Peth and Nolan seemed to like each other from the beginning and were one of the steadiest couples on the show. While proposing, he sweetly said, “I choose to love you this minute, this hour, this day, and every day from here on out. So, Taylor Catherine Nolan, you make me the happiest man on this planet. Will you marry me?” After such an earnest proposal, who would have the heart to say no to him?Nolan certainly couldn’t and happily accepted his proposal! Are Nolan and Peth Still Together? Peth and Nolan are still very much together right now. After all, the proposal was not even two weeks ago! Though there have been a lot of other couples on Bachelor in Paradise whose engagements did not last, it looks like Peth and Nolan might end that trend. At least, that’s what everybody hopes, because they make such an adorable couple! Nolan posted a photo on Instagram with Peth and some other couples from BiP at a gender reveal party for fellow Bachelor alum, Carly Waddell only a week before the proposal. The two look incredibly happy together, and some fans are even wondering if Peth and Nolan will be the next Bachelor couple to start a family! Other BiP contestants have spoken highly about Peth and Nolan’s relationship. One of them is Matt Munson who told Life & Style, “All I can say is if anyone deserves that, if anybody deserves to see their way through to the end, and come out of the whole thing with a ring, it’s Taylor and Derek.” He said this before Peth proposed, which goes to show how obvious it was to everyone that two were meant to be with each other. So, the best thing to have come out of Bachelor in Paradise 2017 is that Peth and Nolan found love in each other and it looks like they will stay together. We wish them both a very happy future together!